Here's a piece of rock history. It's not often you'll find a vintage late 50's Les Paul for sale. Let alone one once owned by a bona fide, card-carrying member of rock's elite. 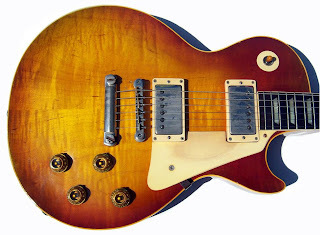 For your persusal is this 1958 Gibson Les Paul Standard, formerly owned by Gary Moore. (eBay Item #: 150400100221). Used by Moore in several music videos and album cover photoshoots, he apparently owned this guitar from 1991 to 1994 before selling it to the present owner. Granted this is not Moore's almost mythical Peter Green '59 Les Paul Standard -- methought he wouldn't have parted with that one for all the Leprechaun gold in Ireland -- but this '58 comes pretty close if you're looking to own a genuine rock n' roll artifact. But as usual, do your research before committing and caveat emptor! They are all nice guitars! Its those guys 'fingers' and hours/years of practice playing that make it sing. We could all have Page's or Moore's guitars, and not get the same out of it that they did! I'll give them $800 for that old tired antique. Too true. Page and Moore could just as easily play made in China Epiphones and still forge ahead with their careers! Nine Inch Nails Selling Tour Gear On eBay!